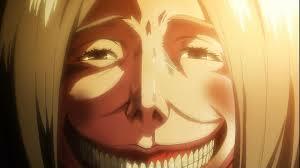 Smiling Titan. . Wallpaper and background images in the Attack on Titan club tagged: photo attack on titan. This Attack on Titan photo might contain 红卷心菜 and 红球甘蓝. "To Heichou: We will always 爱情 you"